This simple cocktail tastes just like summer. And if you’re into this sort of thing, you can swap out the peach with a nectarine or any other fresh fruit, try lemon instead of lime, or add in fresh herbs like rosemary or lavender. Happy summer! Muddle the peach in a cocktail shaker. Squeeze in the lime juice and add the mezcal. I use Del Maguey Chichicapa, because it’s smoky and smooth. Add a few dashes of grapefruit bitters. Stir the base a few times, or shake it if you’re into that. Put a few ice cubes in a mason jar or large glass. Strain the base into the glass and fill it to the brim with ginger beer. I like Fever Tree. It’s spicy and not too sweet. All set. Enjoy! 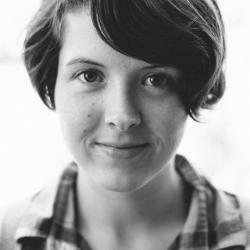 Nicole Fenton is a content designer and writing teacher. She started Born Hungry as a way to explore and encourage cooking at home.